The financial resources of the church of every age fluctuates with the times. 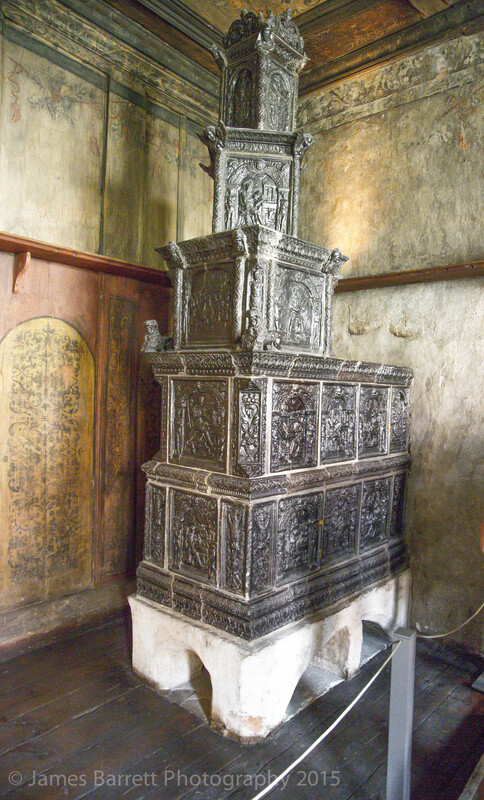 In the 15th and early 16th centuries, the church was wealthy and powerful, largely owing to the belief that the only way to salvation and heaven was by means of the church clergy who guarded the power to assure an ignorant and superstitious populace either that one’s way to heaven was earned – by payment – or that one was a heretic, and then burned at the stake. Over the centuries, the local priest became the “passort to heaven” and the relationship of the people to the church was based upon money. Hence, one had to pay to be married in the church, receive a baptism (without which one could not get into heaven), and receive burial in Holy ground. It was required to work on church land for free and to give an additional collection at the end of each service. In addition, the church sold officially sanctioned relics and required pilgrimages to places owned by the Cathlic Church where money would pass hands for badges, holy water, and certificates to prove that one had completed the obligation. Lastly, there was the sale of indulgences, or certificates produced in bulk and signed by the pope, pardoning sins and granting access to heaven not only for the purchaser but also for dead relatives. A century later, when the Vatican wished to raise money to rebuild St. Peter’s Basilica in Rome, it printed indulgences. A Dominican friar, Johann Tetzel from Pirna, https://en.wikipedia.org/wiki/Johann_Tetzel, set out from in 1516 as papal commissioner to sell salvation. Tetzel is credited with the rhyme: “As soon as a coin in the coffer rings/ the soul from purgatory springs” a reflection more of Tetzel’s tendency to exaggerate rather than the official church teaching. https://en.wikipedia.org/wiki/Martin_Luther#Early_and_academic_life, http://www.theopedia.com/martin-luther wrote to his bishop protesting the sale of these indulgences, enclosing a copy of his proposed points for disputation (now known as his 95 theses) nailed, as was said to be the tradition announcing academic debates, to the door of the castle church (Schlossekirke) on the eve of All Saints Day (now called Reformation Sunday). 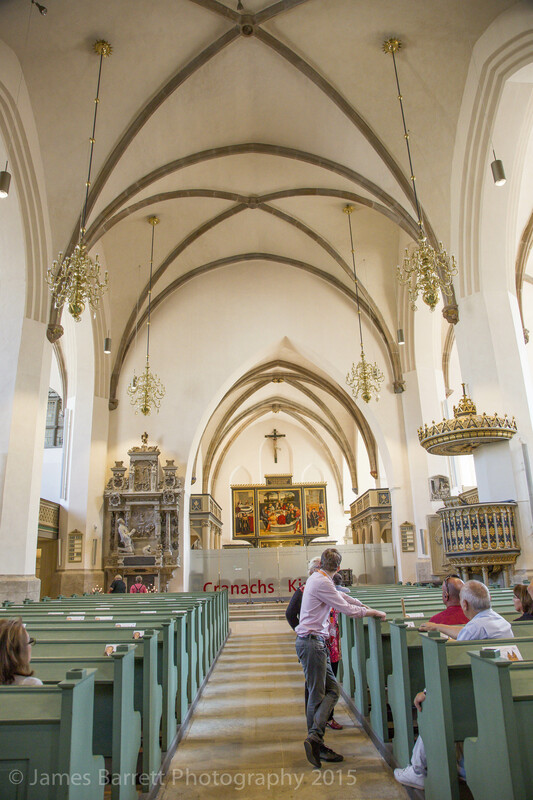 This church, now under renovation, and holds the tombs of Martin Luther and Philip Melanchthon https://en.wikipedia.org/wiki/Philip_Melanchthon , a collaborator with Luther, intellectual leader of the Lutheran Reformation, and the first systematic theologian of the Protestant Reformation. 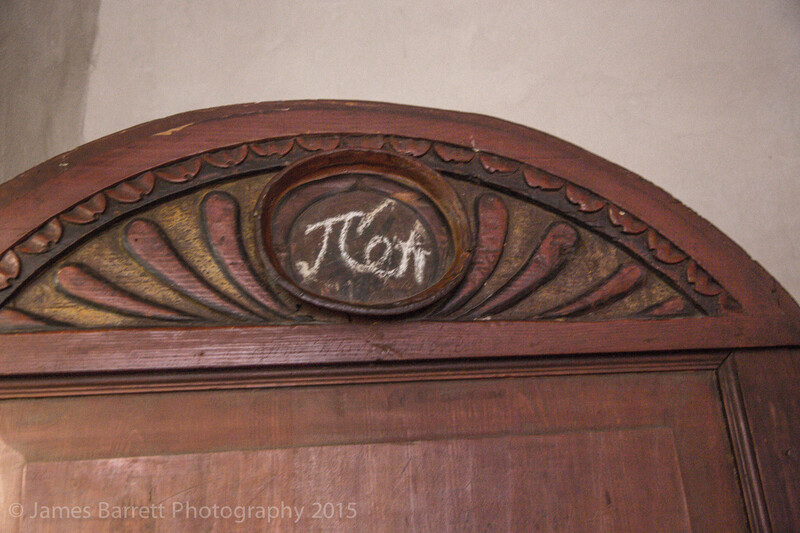 The “thesis door” was destroyed in the 18th century and was replaced by a bronze door. 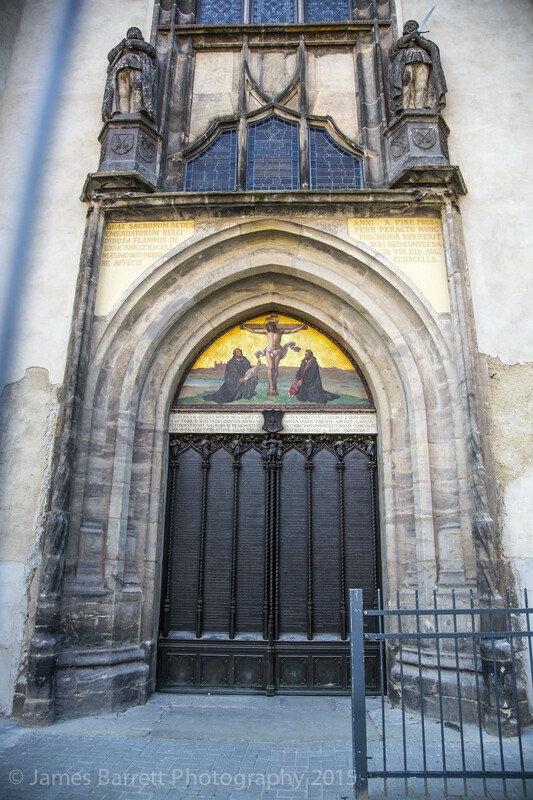 in which Luther also preached, is down the street from the Schlossekirke and contains the altar piece, painted by Lucas Cranach https://en.wikipedia.org/wiki/Lucas_Cranach_the_Elder, illustrating the main sacraments of Lutheran theology; confession is depicted there on the right, but Luther excluded confession as a sacrament as it lacked any external sign. 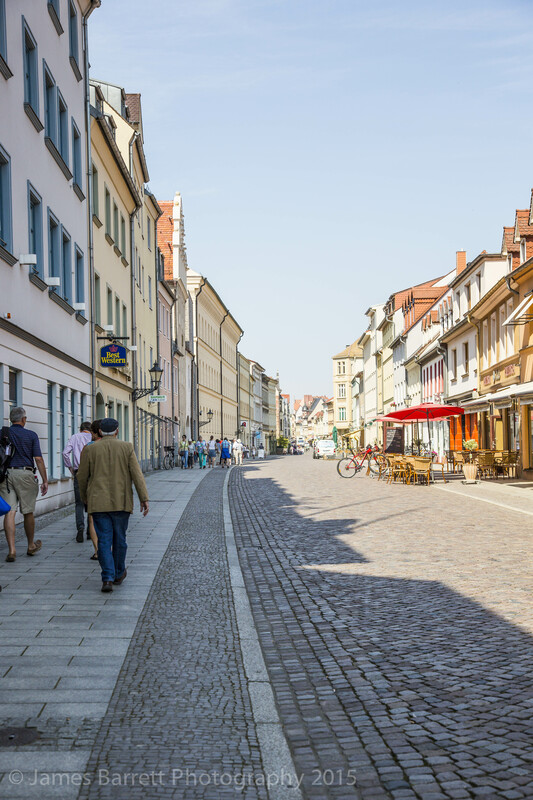 After their marriage in 1525, Katharina took on the task of managing the real estate, breeding and selling cattle, running a brewery, feeding the student lodgers, and operating a hospital on the side. 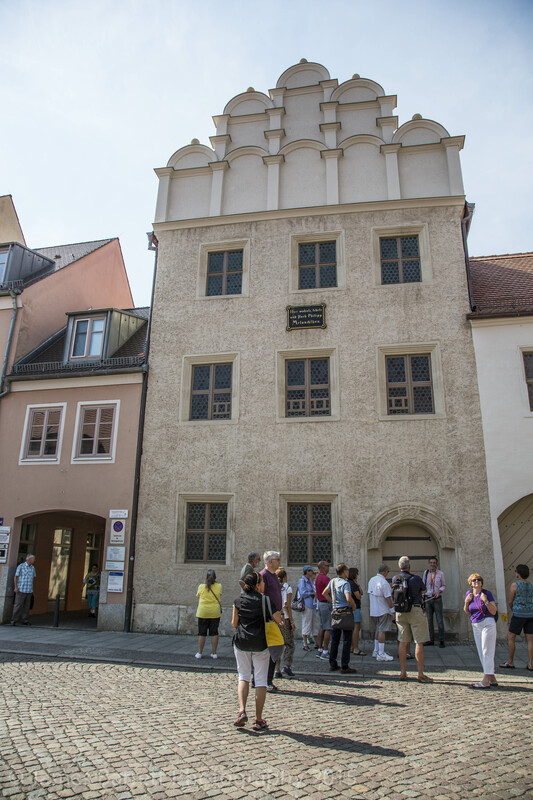 Luther referred to her as the “morning star of Wittenberg”. That was enough to manage, but in addition Katharina bore six children and raised four orphan children. It was on account of Katharina’s talent for estate management and enterprise that his university salary was supplimented leaving Luther to focus on his theological career. 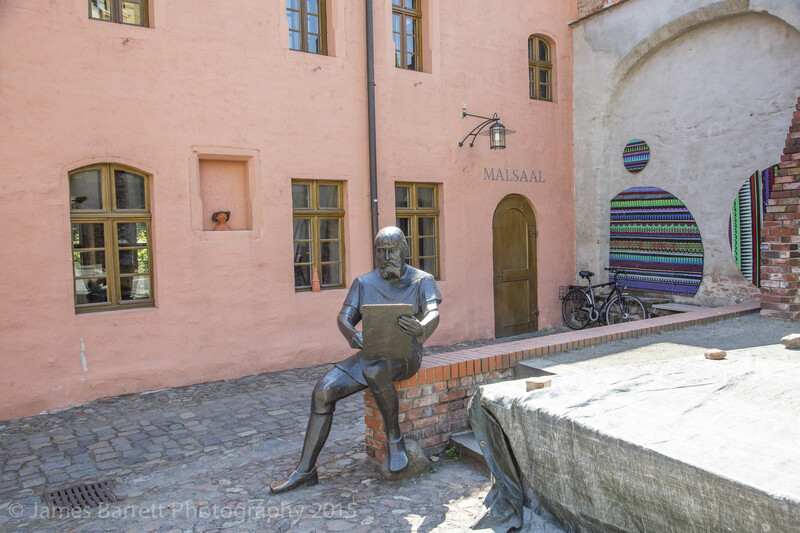 Luther had built a special chair for Katharina to use during the theologic discussions held in their living room. She was the only woman permitted to be a part of those meetings. 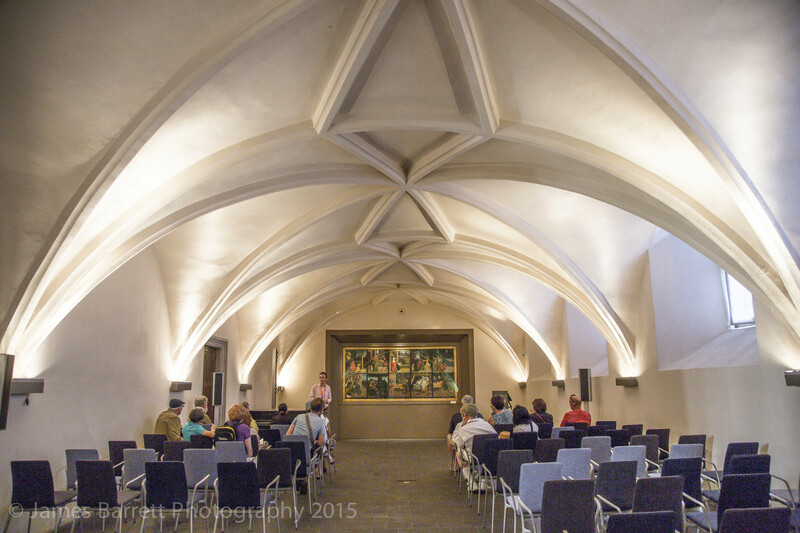 This room, Lutherstube, has been preserved and with the museum within Lutherhalle is open to the public. 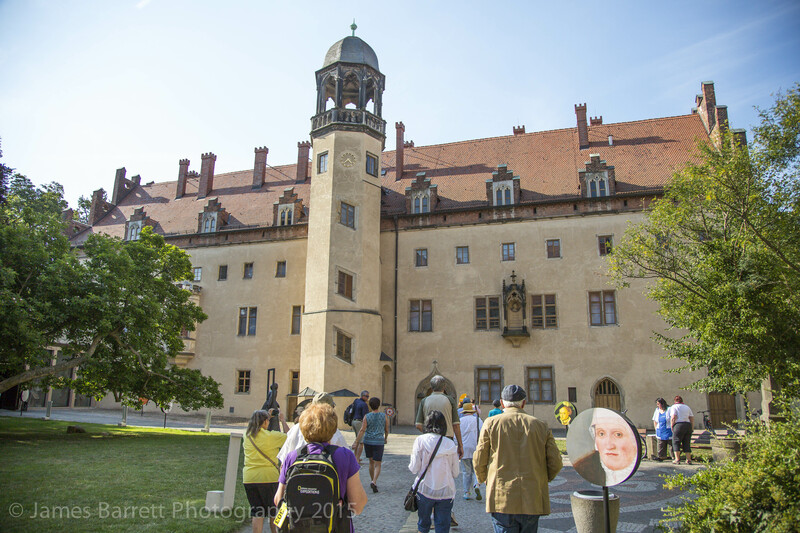 This is the building, once a monastery, where Luther renounced his vows and began the process that would result in the Protestant Reformation. 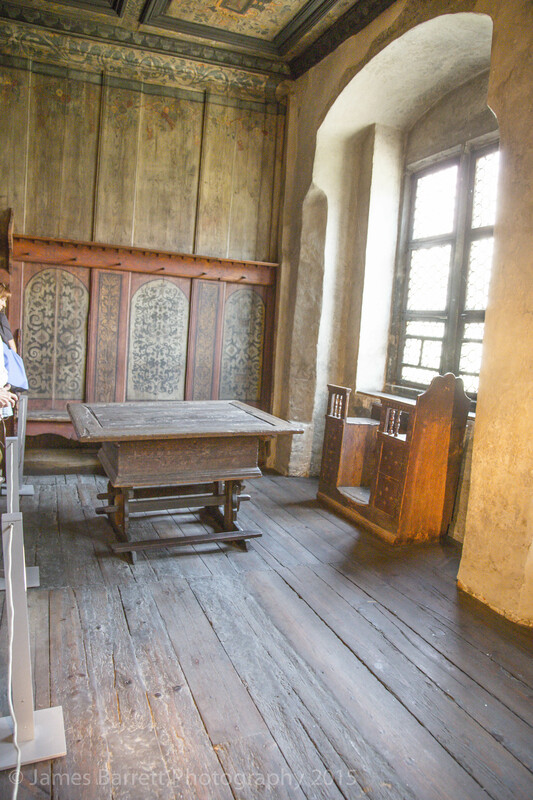 Below is a picture of the lecture hall and the room in which Luther, his students and, by special permission, his wife would spend hours discussing theology and sipping Katharina’s beer. Note Katharina’s chair by the window. 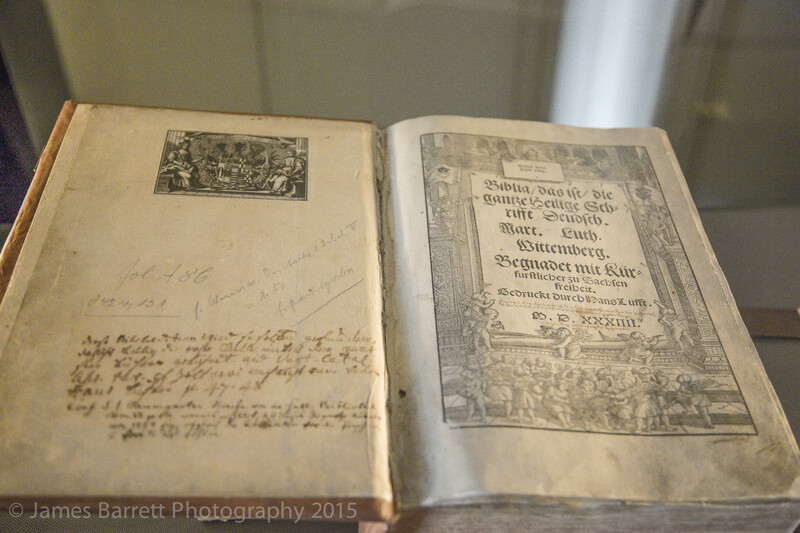 Luther’s Bible with his original translation of the New Testament into German. Wood block prints are by Lucas Cranach. 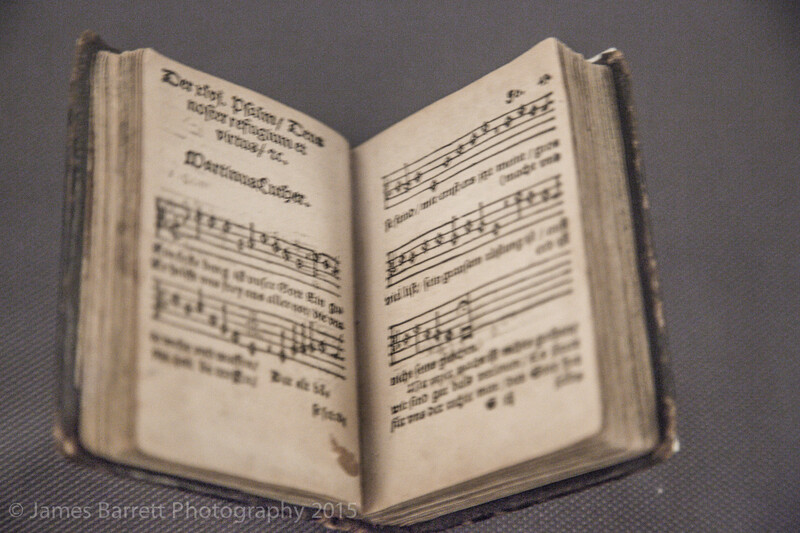 Below is the first edition of Luther’s hymn book open to Ein Feste Berg (A Mighty Fortress is our God), in its original syncopated rhythm. 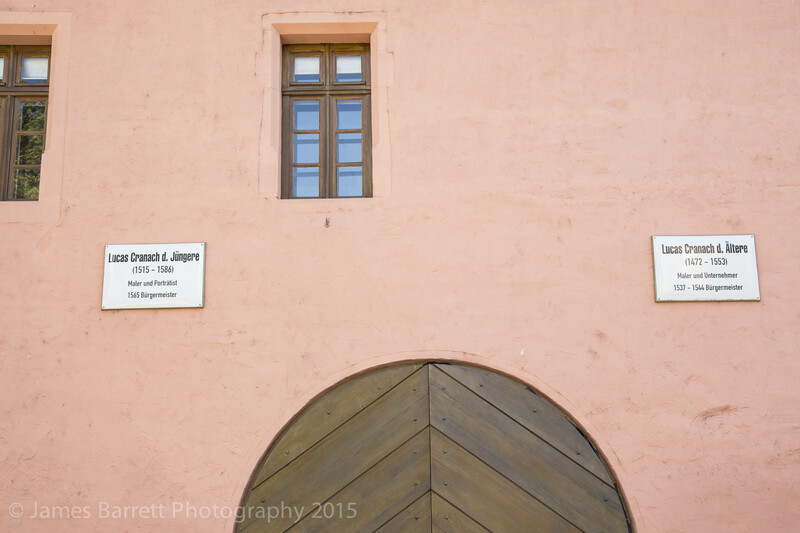 This is a view of a street in the old town. 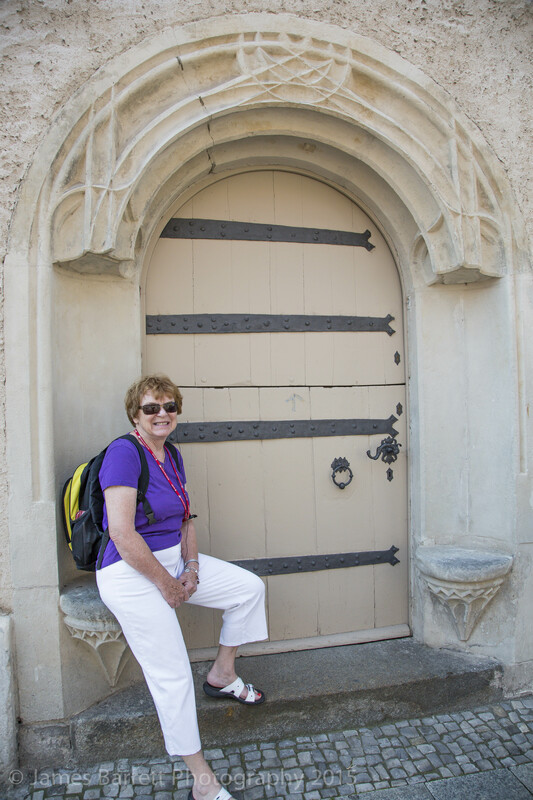 This is the door to Malanchthon’s home, enhanced by my bride of five decades. 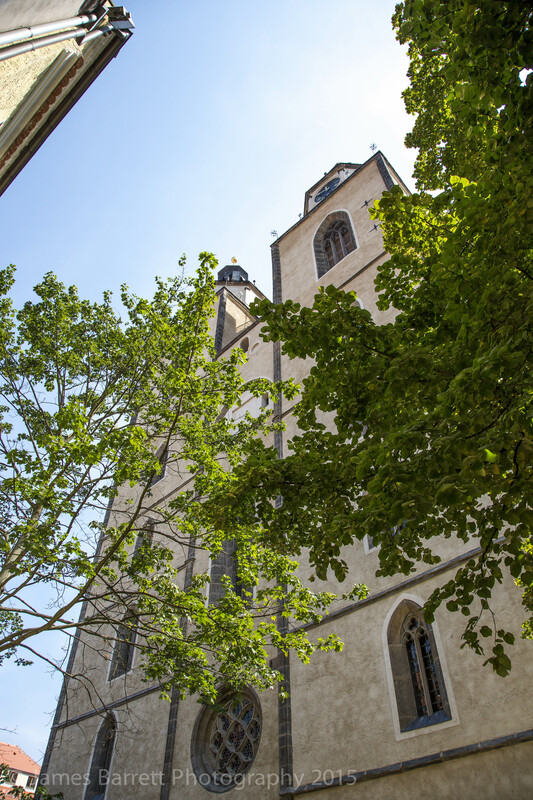 The twin towers of St. Mary’s Church, the Mother Church of the Protestant Reformation. 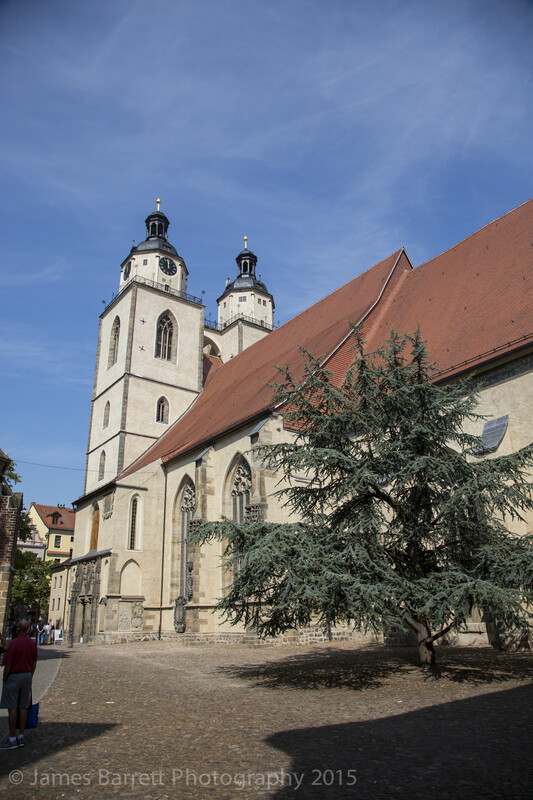 St. Mary’s Church, where Luther preached, saw the first celebration of the Mass in German rather than Latin, and the first distribution of the Eucharistic elements of bread and wine, earning St. Mary’s the title of Mother Church of the Protestant Reformation. 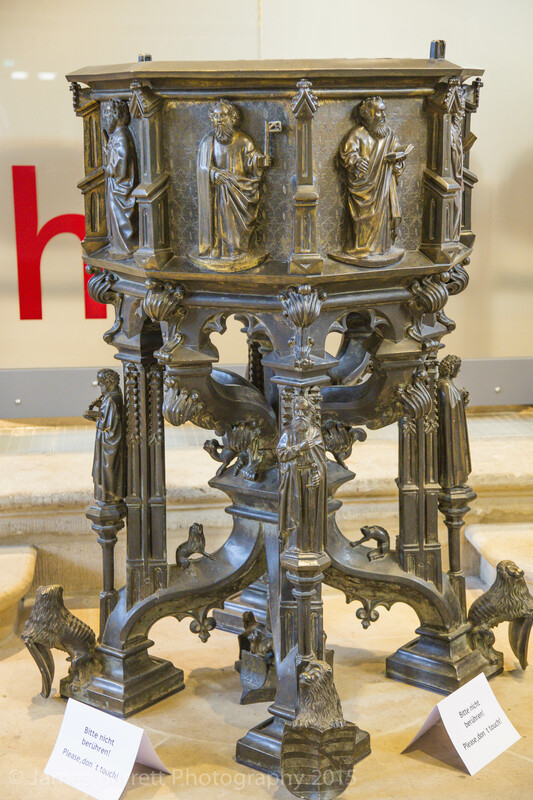 Below is the pulpit from which Luther preached, on his knees. 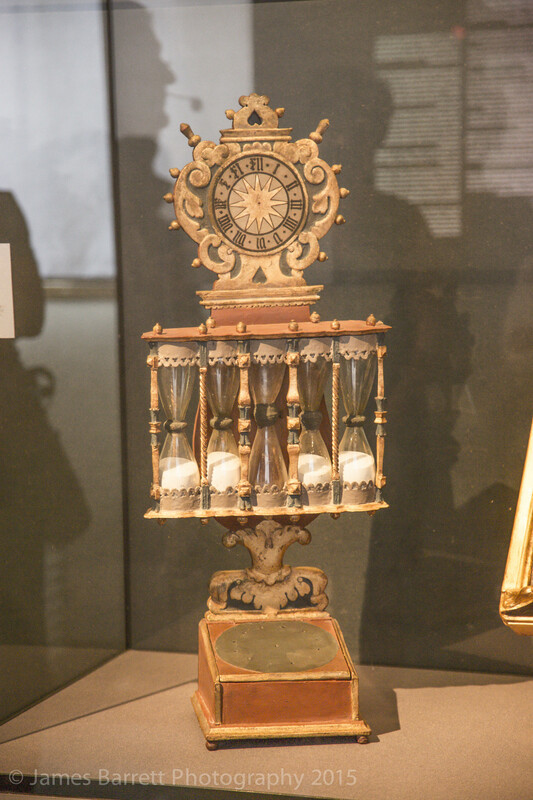 Following are pictures of Luther’s robe and a sand dial timer to limit sermon length. 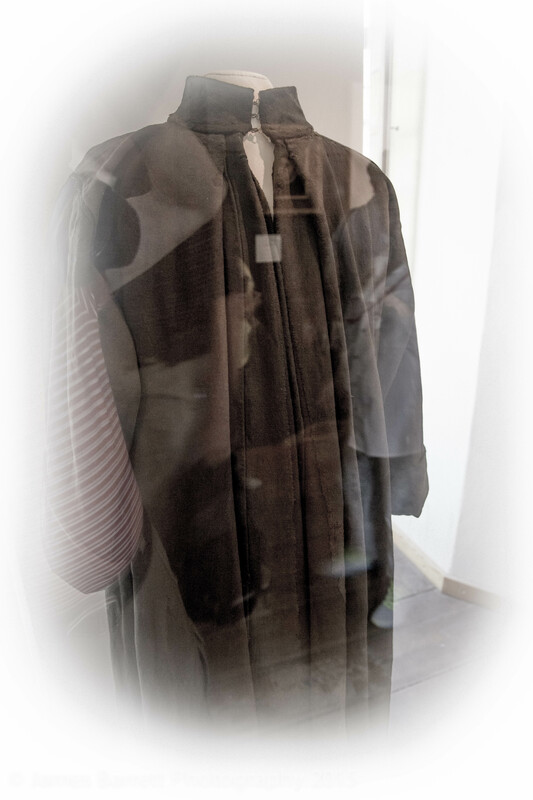 Judging by my reflection on the robe’s case, Luther was shorter than I am. 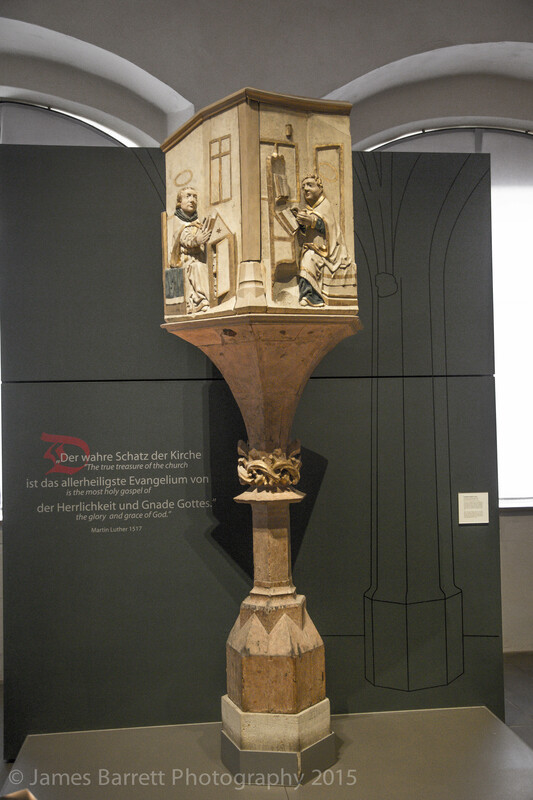 This is the baptismal font used by Luther and still today. 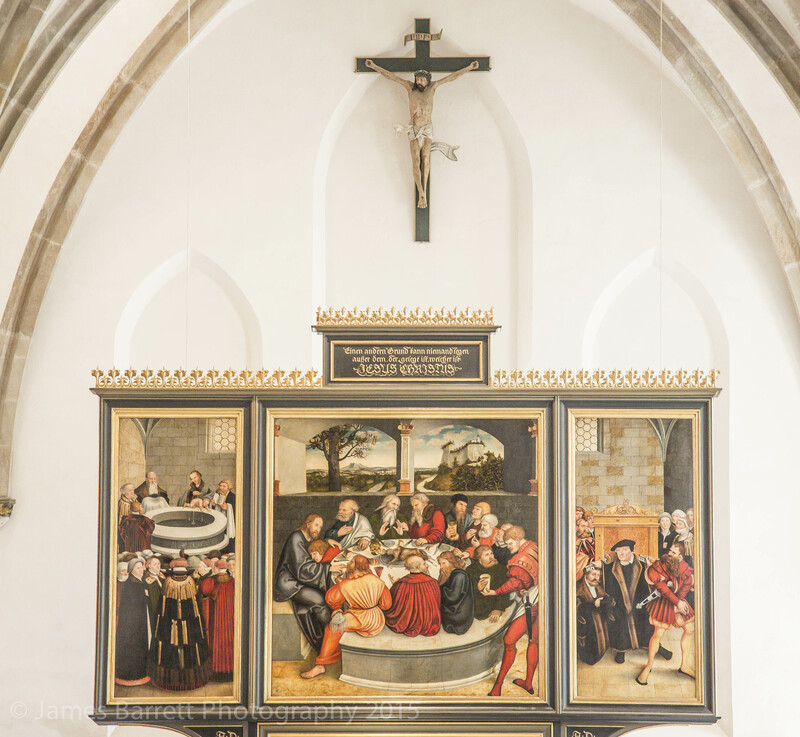 Below is the Altar piece painted by Lucas Cranach in 1547, portraying the sacraments of Baptism, Communion and confession – later abandoned by Luther as there were no outer signs. 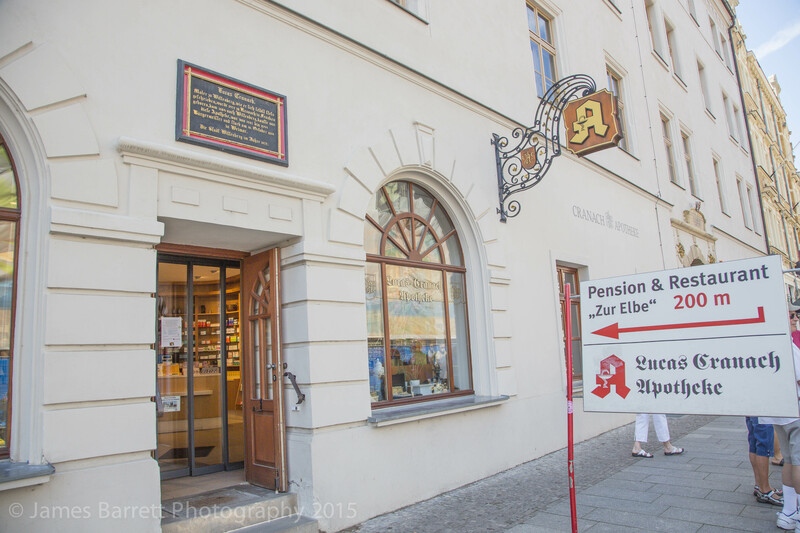 Cranach had provided wood cuts for Luther’s translation of the Bible from Latin to German, and owned the pharmacy in town. 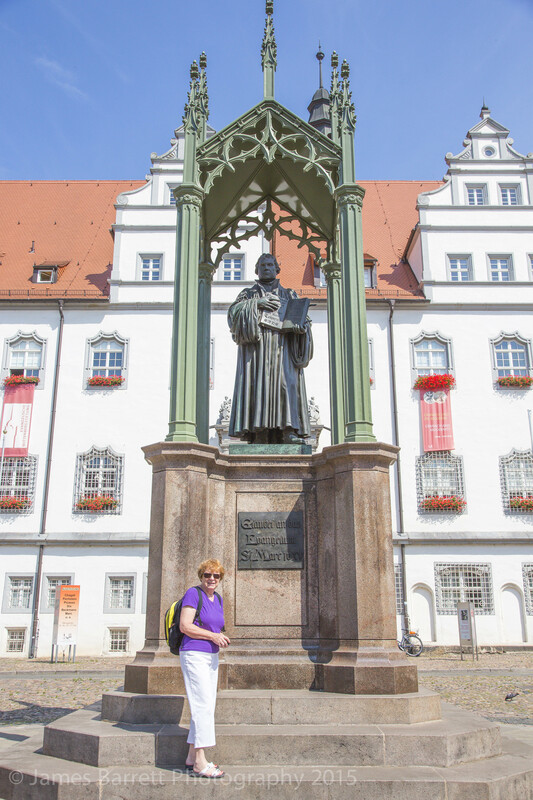 The monument commemorating Luther in the Town Square is perhaps the first one honoring a non politician or royalty. As such it was allowed only with the addition of a canopy. The Town Hall is in the background. 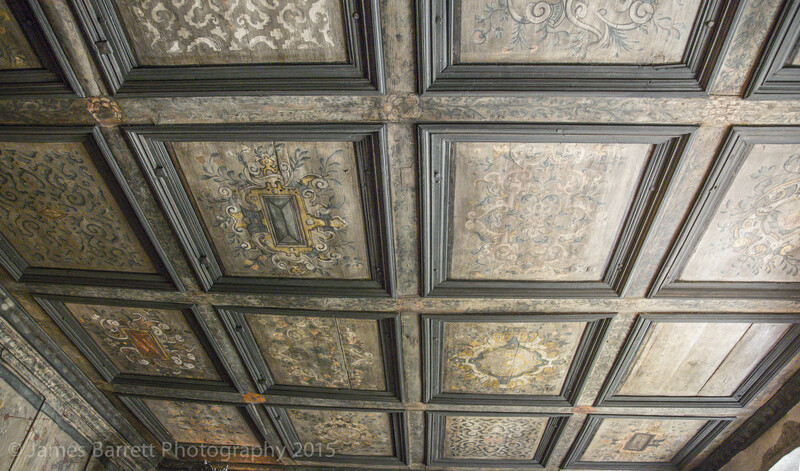 This and the next shot are of the studio where Lucas Cranach and his son produced their art. 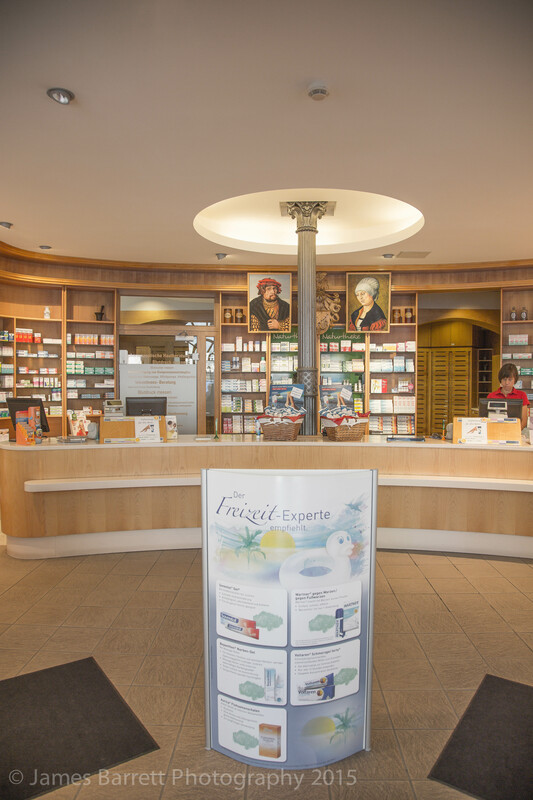 And this is the pharmacy which was started by Lucas Cranach. This, the Schlossekirke, is where the tombs of Luther and Philip Melanchthon can be found, and where the door upon which the 95 theses for disputation were alleged to have been nailed. The church is being remodeled, the door is now of brass. 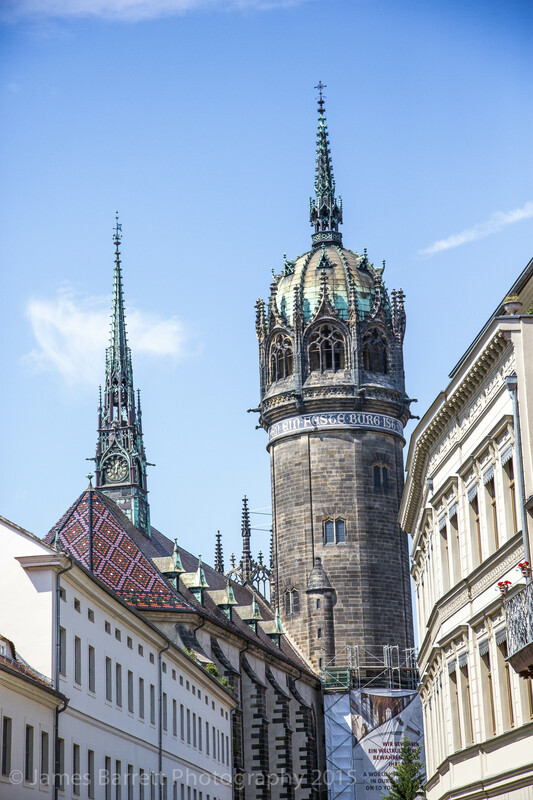 Wittenberg has the world’s highest density of World Heritage sites.